Constraints are restrictions (limitations, boundaries) that need to be placed upon variables used in equations that model real-world situations. It is possible that certain solutions which make an equation true mathematically, may not make any sense in the context of a real-world word problem. Constraints then become necessary to allow the mathematical model to realistically represent the situation. or the y-values (dependent variable) associated with an equation. 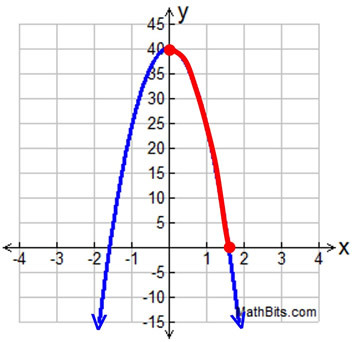 When graphing, the set of all possible x-coordinates used to create the graph are referred to as the domain. Constraints may already be stated in a problem as limitations upon the domain, or may need to be specified if the situation is reality based. The set of all of the y-coordinates used by the domain elements is called the range. 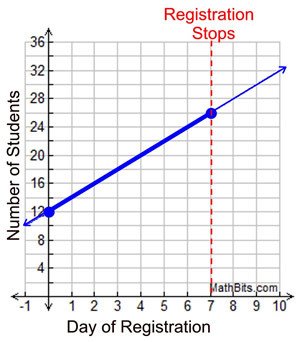 It is discovered that the college registration process for Professor Smith's Calculus class can be modeled by the equation y = 2x + 12, where y = the number of students registered at the end of each day, and x = the day of registration. Professor Smith has 12 students pre-registered before the registration process begins, and the registration closes after 7 days. While it can be said that y = 2x + 12 models the registration process for this Calculus class, you can see that the "real" model is only a portion of this straight line. There are no "negative" days for the registration process, and there are no days beyond Day 7 for registration. y = the height above the ground in feet and x = time in seconds. While it can be said that y = -16x2 + 40 models the fall of the ball, you can see that the "real" model is only a portion of this quadratic graph. There are no "negative" seconds of time, and there are no heights below ground level. The ball hits the ground after approximately 1.6 seconds, which is the end of its fall.